Sequel to a relatively unknown SNES game available very soon. DSiWare is in dire need of platformers! If you've kept your eye on the various rating boards, you might've noticed that a game called Oscar in Toyland has been rated as DSiWare release for quite a while now. Out of the blue, it has now been announced that the game will be released in this Friday's European Wii and DSi update. Only recently did we learn that this is actually a sequel to an old platformer for the Amiga, PC and SNES simply called Oscar - This game will star the same character and seems to be quite similar in terms of gameplay and graphics. Although the original game was not that well-known, the general opinion seems to be that it was quite fun. This new one will cost 800 DSi Points, so hopefully it will be worth all of them! You can visit the game's official site for some screenshots and a downloadable trailer which we'll add to the game's page here as soon as we can. The game was originally called Trolls and featured the gonky Trolls that were so popular with kids a few years ago. This was a HUGE seller on the Amiga and PC worldwide. It was then followed up with Oscar a similar game but aimed at a slightly older market, with more adult levels based around different movie themes. This game was again HUGE on the Amiga, PC and SNES. The game was used to launch the first CD based games console the Amiga CD32 and then the Amiga A1200, Commodore’s President called the game his Sonic and was bundled with every CD32 & A1200 worldwide. When we decided to put Trolls onto the DSi we decided to go with the Oscar character as he has more appeal for today’s market. The game therefore has the game design of Trolls but with the Oscar character. The graphics and gameplay have been much enhanced from the original games and feel confident that DSiWare customers are going to love this game at a bargain price of 800 points. I'm happy to see platformers hit the service, but the screenshots make me a bit nauseous; it's not even the fact that's so bright and colorful per se, but the particularly gaudy colors and combinations chosen. Reminds me a bit of Ribbon Road in Mario Kart Super Circuit, which I also greatly disliked (the track, not the entire game). Not quite sure what to make of it... Don't think I'll risk it. I'll wait for the review. Normally I would be very excited by a dsi sequel to an obscure SNES platformer. Doesn't feel right though. I will also wait for the review. I remember this one, looks more like one of those Sonic-wanna-be's (I don't mean it's a bad thing, Sparkster and Mr. Nutz, for example, are awesome) but this one is not that good, too generic in every aspect (theme, gameplay, etc). But it's interesting to see a sequel of it. I remember this game from the old DOS days but I never played much of it. It looks incredibly similar to the first one though. There was another game that looked very similar to this called Trolls, which was made by the same people. Look cool, and hope it comes to the US soon. The one review of the first game on GameFAQs makes it sound pretty good, and gives it an 8/10. Makes me hope they can get it on VC. It would make sense, with them releasing a DSiWare sequel, right? There will probably be a review up before it's even available in NA, so I don't have to worry about that. Looking forward to hearing more about this one! Well, if it's good I'll take it, I love platformers and the DSi is kinda short on non-puzzle games. I never knew this game ever existed on the SNES or on DSiWare. I will wait for a review. Looks a bit too...strange for my tastes. OMG!! I used to play Oscar all the time when I was younger but on the PC! I have to see if I can find it again! I'm a bit nervous about this title as it seems to stem from the characters with 'tude era. The era where every other game was trying to be Sonic but more mediocre. Hopefully this will be fun as dsiware still lacks a true platformer. I played the first game on the Amiga getting on for 16 years ago. Here's what I can remember for those that never had the chance. The original game had Oscar trapped in a cinema, and to escape from it you had to visit in any order you want the 7 movie themed levels (cartoon, jurassic, war, horror, western, sci-fi and gameshow (yeah I don't get that one either)). Each level was split into a number of "acts" that could only be completed once a set number of gold oscar trophies (hence the name) had been collected and the clapperboard found. Each level's theme not only applied to the enemies, but to Oscar's appearance. For instance the war level put Oscar in a green combat jumpsuit and tin helmet, horror had him dressed as a vampire, and so on. Your primary method of attack like most platformers at the time was simply jumping on their heads. Some however couldn't be got rid of like that, so you needed to find a Yo-Yo hidden in one of the many film cannisters littering each act. Other powerups and powerdowns included the usual stuff such as trainers (speed and jump higher) ball and chain (slow down, jump lower), invisibility, clock (frozen enemies). Perhaps the oddest though were the Game Gear (caused all the colours washed out) and the Game Boy (similar but everything goes green). There were bonus stages at the end of each level, but was also available between each act if all the BONUS letters were found. 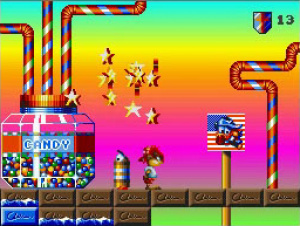 This was more or less a timed stage filled with There was also a much harder "bogus" stage which was essentially the same but with a bigger reward on collecting specific items from the bonus stage, but you only got that if you collected the G rather than the N.
I enjoyed Oscar at the time but compared to other platformers out on the Amiga such as Zool it felt like it was lacking just that little bit of magic. I guess it also didn't help that it was more or less a graphic swap on Trolls, a game of theirs they released a few months earlier. Virtual Playground appear to be the same software house, but under a new name as these days they specialise in business simulation/tycoon games. It'd be interesting to see how well they return to their roots. Keeping an eye on this one. Once i get my dsi , this will be my first game. I didn't think the dsi would ever get platformers..
Wow, good call; you're absolutely right about that. mmm,looks interesting, i will need a review to see how this ends. This is exactly what I want on my DSiWare. DLC platformers. Im buying just to support the genre on the service regardless of reviews. @ Zak Canard: Really interesting find, this requires more investigation! Neat, hopefully it will come out here in the states soon! I was kind of hoping for MFC or BT Arts but I can't complain after the EU got Mari v DK and Pop Plus Solo last Friday! Never heard of the original Oscar. I don't remember any of the magazines I read at the time mentioning it at all. I don't have a DSi but even if I had, I'd still have to pass. Sorry, Oscar. Or "Premiere" (another legendary Amiga jump`n`run).Immagine if Nintendo makes more snes/amiga "revivals"
You folks think there is any possibility it will be on the DSi ? i guess it`s a no... a man can dream though.This is exactly why i have nothing against homebrew.bu that`s another topic.sorry,had to say it. BTW,i do not own any flashcarts. While we're talking about old jump&runs, the original Giana Sisters on the DSi might work, the Retro level in Giana sisters DS was much easier due to the physics in GSDS and some level alterations (especially in the enemy selections, I remember that vicious ball in Level 3 being gone). These screen shots make me feel drunk. It does look like Kirby....on Acid! It still looks like it could be really fun. Perhaps even the Toki Tori of DSiWare? WAIT !!! Platformer that does not require strategy more than gameplay, but reversed???? MVDK was good, but not like the original and was questionable. and now people are questioning a game like this?! What are you people on?! This is the game that will knock guitar rock tour and may even include MVDK (although i do love dk and mario) knocked off the top 20 forever!!! This is the next game i want!!!!!!!!!!!! no games for christmas, only NINTENDO POINT CARDS!!!!!!! !